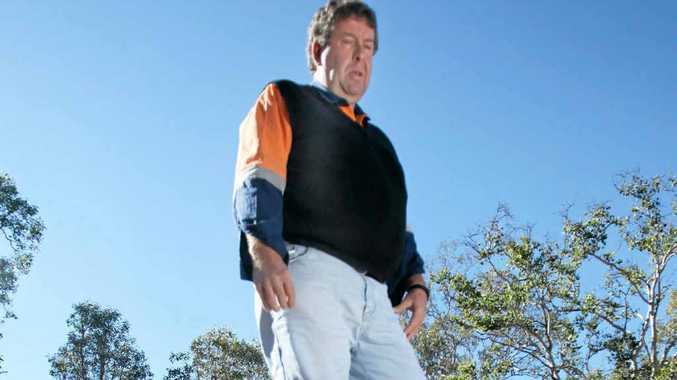 TRUCKER Layne Perkins fought to keep control of his fuel tanker at speeds of 100kph when it was hit by a falling gum tree on a bridge. The veteran driver needed all his 30-years experience as the trunk of the gum tree smashed through the truck's windscreen, showering him with shards of glass. Layne, who lives at Mt Chalmers, took the day off yesterday to recover from the shock of the million to one accident he believes could have cost him his life. "One minute I was listening to the radio, the next I was covered in glass and in total shock," said Layne, who was on his way home after delivering fuel to mines near Blackwater when the drama unfolded. He said by the time he had realised what had happened he had instinctively slammed on the brakes, locking up all the wheels of the tanker, which mercifully pulled-up in a straight line. "I was very lucky there wasn't another vehicle coming the other way and that I was wearing my driving glasses. "I hate to think what might have happened if the flying glass had gone in my eyes." The tree fell as Layne drove over a bridge over the Dawson River about 12km east of Duaringa at about 10pm on Tuesday. The highway was closed as the tree was hauled from the road and the damaged truck was recovered. An ambulance crew treated the cuts to Layne's face before he was driven home by car. "It was at least 2am before I got home and I was still shook up by what happened," said Layne. "The truck sustained thousands of dollars worth of damage. "If the tree had fallen on a car it would have crushed it. "It would have been a major mishap. "The metal rails on the bridge were buckled by the impact." And to prove lightning can strike twice, it was the second time in a few weeks that a falling tree has slammed into a truck near Duaringa.